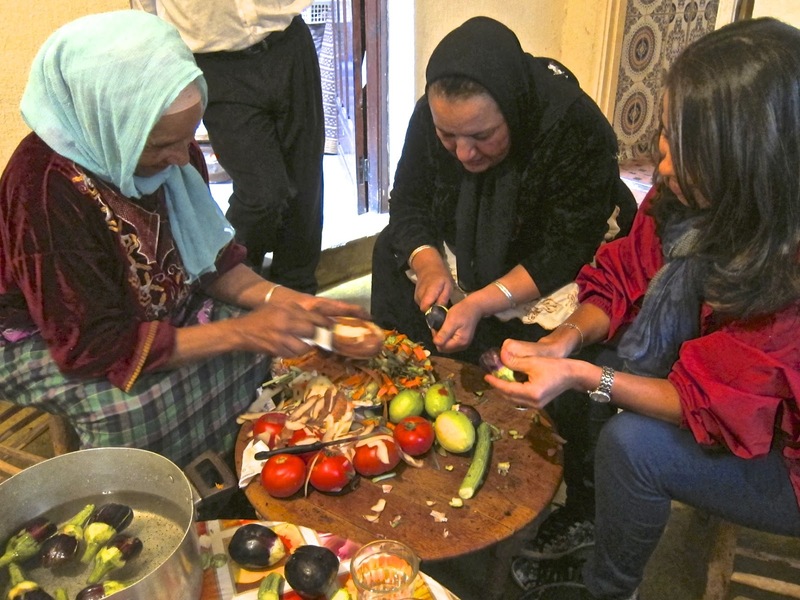 Taking a cooking class is a great way to learn about another culture. 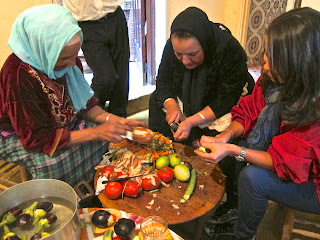 In Morocco recently we had a cooking class in a very unlikely spot--a mountain top in the High Atlas Mountains. 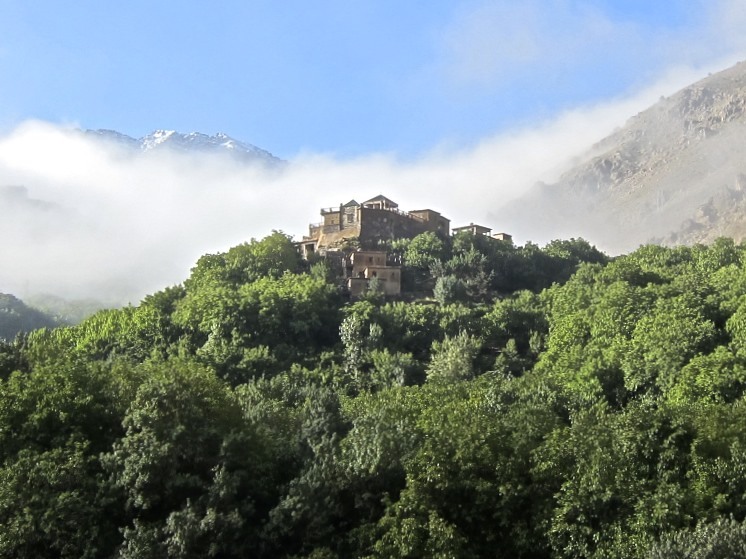 At the trekking hotel, Kasbah Toubkal, adventurers head off by foot and donkey on trails that go deep into the mountains for all-day and all-week trips. Berber villages cling to the sides of the mountains, accessed only by dirt trails littered with donkey poop and walnut shells from the orchards along the path. For our cooking class, in a clean and organized kitchen, straight out of the 1960s, our group sat on low stools around tables covered with whole chickens, large chunks of bone-in lamb shoulder, fresh tomatoes, turnips, carrots, onions, garlic, zucchini and a jumble of herbs and spices. 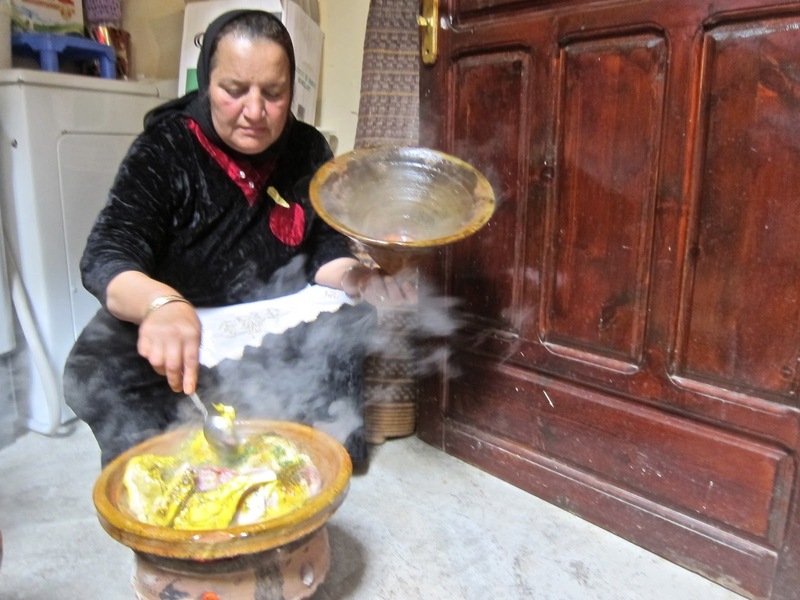 Haja Rkia ben Houari ("Haja" because Rkia had completed a pilgrimage to Mecca) had invited us into her kitchen to show us how to make a traditional Moroccan meal of couscous, tagine, freshly made bread and mint tea. Haja Rkia was assisted by Fatima. 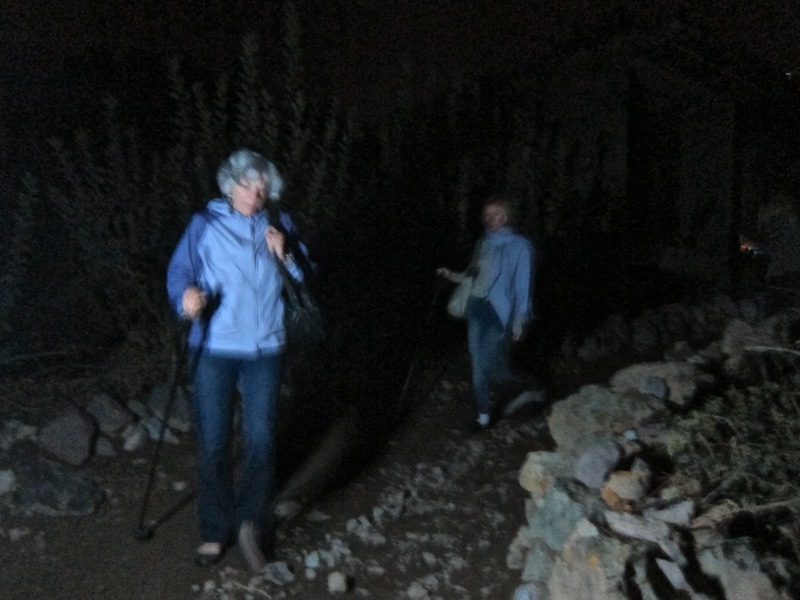 Since they are Berber, their approach to these national classics has a local touch. 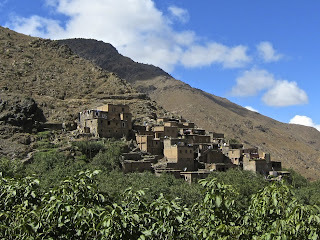 In the morning we passed through Asni, the Berber village in the foothills below Kasbah Toubkal in Imlil. The Saturday market has everything you would want to prepare a meal: live poultry and rabbits, fresh produce, herbs, spices, sweets and baked bread. Women are not allowed in the market. Men are sent to get what their household needs. But the the fresh produce for our meal comes from the gardens in Imlil, the village at the bottom of the dirt road from Kasbah Toubkal. Haja Rkia leads me to the cold room to pick out what she wants to use. We carry back an enormous bowl filled to overflowing with fresh produce and root vegetables. No plastic wrapped tomatoes from the supermarket for this meal. The prep room where the meat is cut apart and the vegetables cleaned and peeled is in a side room off the kitchen. 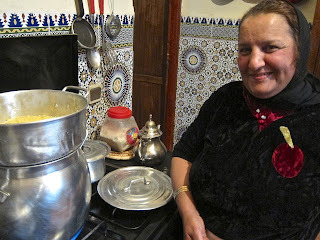 The couscous will be cooked on the 1960's stove. 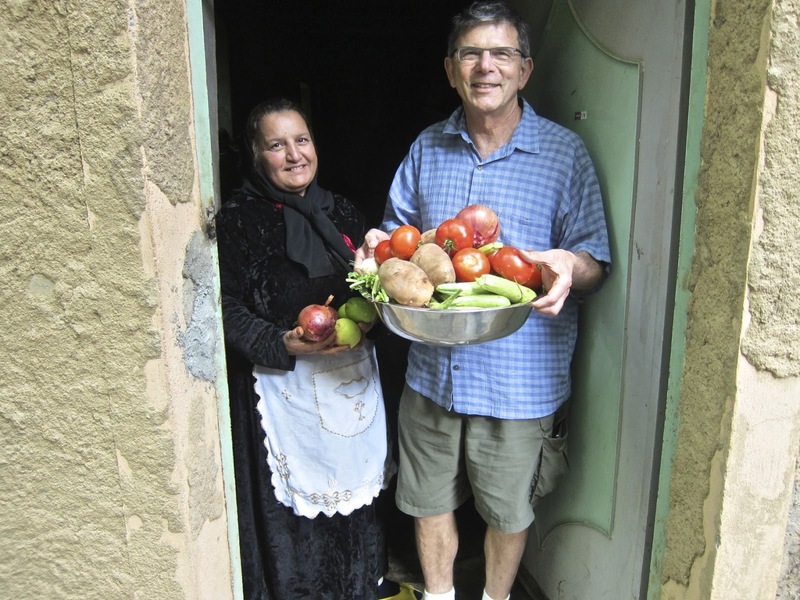 The tagine--the conically topped, glazed clay cooking pots that are uniquely Moroccan--will be cooked in the open air laundry room on charcoal braziers. 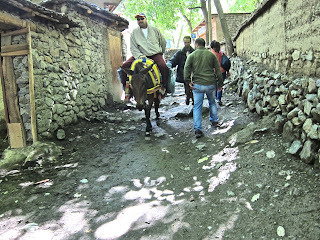 The fresh bread is toasted on a wood fueled, mud stove in an open air shed outside. 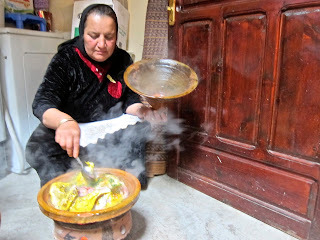 Fatima crouches within inches of the fire, using her smoke blackened fingers to gently turn the flat bread again and again on the hot metal cooking plate. Each side of the bread takes on a beautiful caramel color. 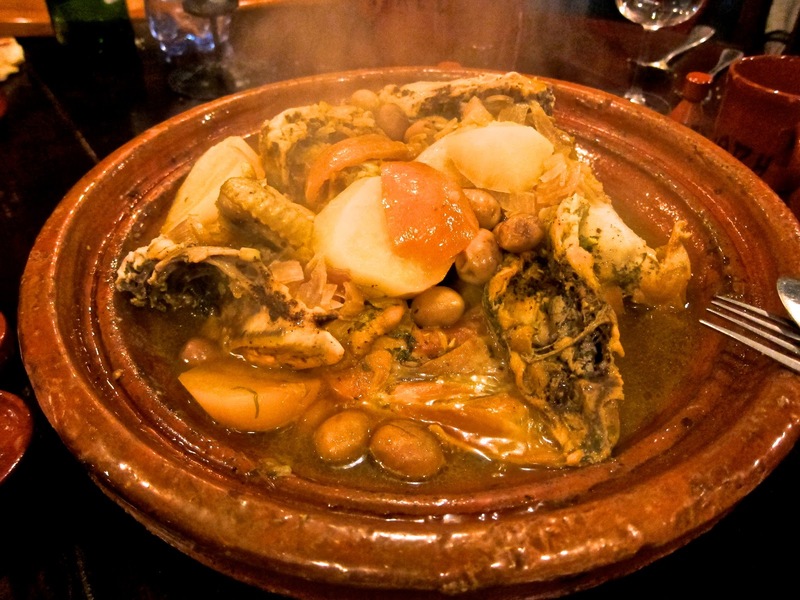 Smoke from the fires soaks into the tagine and the bread adding a lovely fragrance. 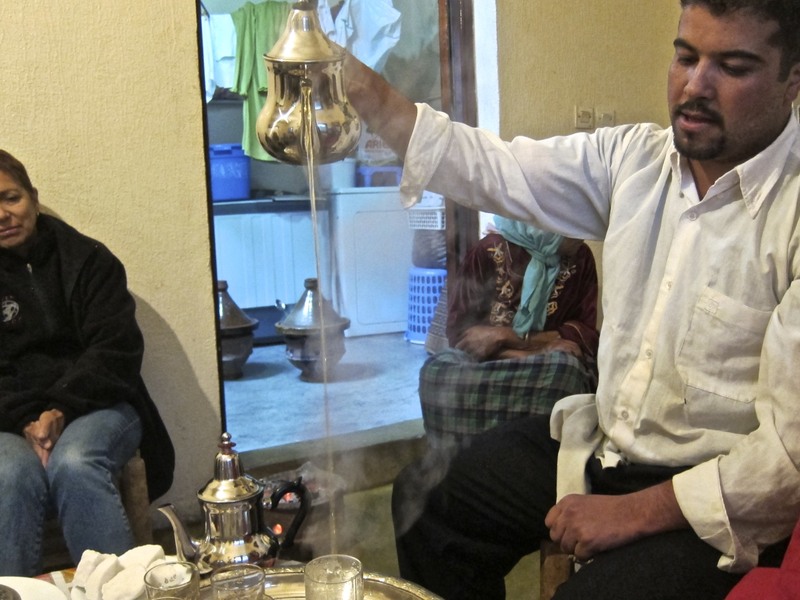 Not every American kitchen has tagine and couscous pots. Happily, the recipe for chicken tagine can be made in a covered pot used for braising. 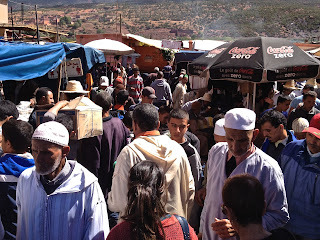 When Moroccans entertain, they make enormous amounts of food because no host wants their guests to go home still hungry. The dinner was delicious, especially the bread. 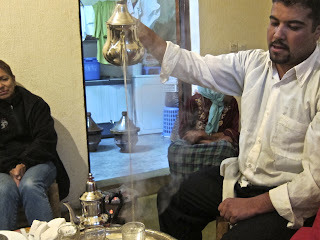 To finish the meal, we were served mint tea, which in Morocco means sweetened green tea, flavored with fresh mint leaves and served with ceremonial flair, the pot raised high in the air to aerated the tea and impress the guests. The tea packs a wallop. Heavily caffeinated and tarted up with white sugar, the tea woke us up after the heavy meal and helped us manage the long walk down the hill in the dark. Tagines are used to cook combinations of vegetables, meat, poultry or seafood. 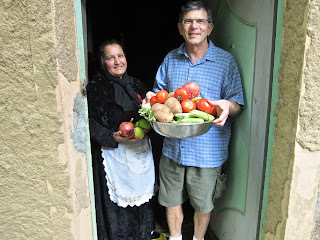 Because our couscous used copious quantities of vegetables, for contrast Haja Rkia used potatoes for our chicken tagine. Put the whole chicken into a large contained. Cover with water. Add 1/2 cup kosher salt. Refrigerate over night. Before using, rinse and pat dry the chicken. Cut apart the chicken. Wings, legs, thighs and breasts quartered. Bend the cilantro in half to better control and finely cut. Place the garlic and cilantro pieces in a mortar and pestle and mash together or crush on a cutting board using the flat side of a chefs knife. Place the chicken pieces in the tagine. Add the oils, herbs, spices and toss well to coat. Place on a medium flame and cover. Scrape the white part off from the preserved lemon peel and discard. Cut the peel into slices and set aside. After 15 minutes, add the chicken stock or water and cover. Turn the chicken frequently. When the chicken is tender, add the potatoes and preserved lemon. When the potatoes are tender, add the onions. Cook another five minutes and move the tagine to a trivet on the table. 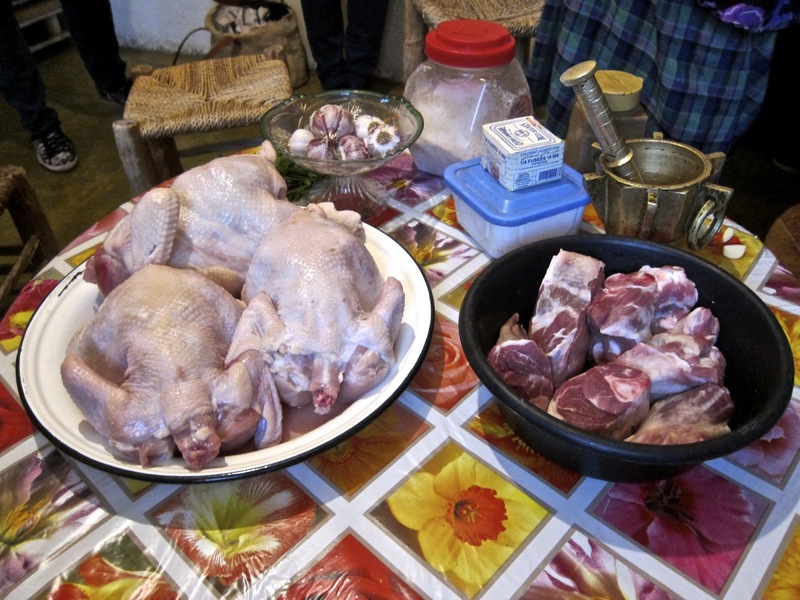 If using a pot, transfer the chicken and vegetables to a serving dish and place on the table. Slice open the hard boiled egg and place on top. Sprinkle with the green olives.